Published in the South Kent Gazette, 2 April, 1980. Near he Tunnel site, Mr. Brady, Engineer of the South-Eastern Railway, put down a boring 2320 ft., and discovered ten seams of coal, varying in thickness from 1 ft. to 4 ft. Here followed the first colliery sinking in Kent, but water difficulties, and the fact that better seams were found east of the Dover and Canterbury road, caused the proposed colliery to be abandoned. The Shakespeare Colliery venture will be dealt with more fully in the final chapter of this book. “The removal of the old, dilapidated, unsightly houses, or, more properly speaking, hovels, at the back of the Pier, which constitute ‘Old Dover,’ with all their consequent filth and rubbish, will indeed be an abatement of a nuisance, and will clear modem Dover of a disgraceful eyesore.“ Enlarging on the prospective change, the writer added: “The railway will clear Beach Street, the whole of the South Pier houses, and a part of Seven Star Street, which will include nearly all the shipwrights of Dover, not even excepting Mr. Duke, whose residence will also come down." Mr J. Duke seems to have been the leading shipwright of that period, and, as he alleged that there would be no possibility of finding another site in Dover suitable for his business, he asked the Railway Company to pay him a lump sum of £9,000. To that the Directors demurred, and a jury, which sat at the Town Hall two days in August, 1843, awarded him £4,050. This included. In addition to the ship-building business, Mr. Duke’s residence and three houses In Fisherman’s Row. This shipbuilding business was quite up-to-date for that period. In 1826 two steam vessels were built there for the Swedish Government. Also in this railway clearance scheme of 1843, sixteen houses and two warehouses in Archcliffe Square and Beach Street, belonging to Mr. John Finnis, were purchased and taken down, but in that case the compensation was settled by mutual agreement, as were the compensations paid to other owners of Beach Street house property that was demolishes The “Mulberry Tree“ Inn, kept by Mr. Gravener, under Archcliffe Fort, was also removed by agreement; but a jury had to settle the compensation for the rope manufactory, carried on by Mr. J. Jones, on the shore at the foot of the cliff between Arch Cliff and Shakespeare Cliff. The land had been bought previously, and the total amount awarded for the factory and loss of business was £1,156 11s. It may have been in Duke’s yard, and, if not, it was almost certainly at one in this area that the first power-driven vessel was built on this side of the Atlantic. James Rumsey came to England from America in May 1788 to promote his invention of a steamboat and paid 600 guineas for the hull to be built at Dover. The engine was installed in London and the vessel, the Columbian Maid, made her first trip on the Thames early in 1793, a few weeks after Rumsey’s death. The “Maid“ was driven forward by a form of jet propulsion, water being drawn up from beneath the vessel and pumped out at the stern. Messrs J. H. and J. Duke are recorded as having built at Dover, in 1826, the steamship Curacao which crossed the Atlantic from the Netherlands to Paramaribo, in Dutch Guiana, in May 1827 and reached Curacao in June that year. This was 11 years before the celebrated crossing of the Atlantic, from Cork to New York, by the British steamer Sirius. The Curacao was bought, while on the stocks at Dover, for the Dutch Royal Navy, but fitted with her engines in Holland. Launched from the Dover shipyard of J. H. and J. Duke, in 1825-6, the Calpe, later re-named the Curacao had the distinction of being one of the first steamers to cross the Atlantic. She made the epic voyage IX years before the Sirius which completed the crossing using steam power only. The question in doubt is whether the Dutch-owned Curacao made her historic crossing without using her sails. 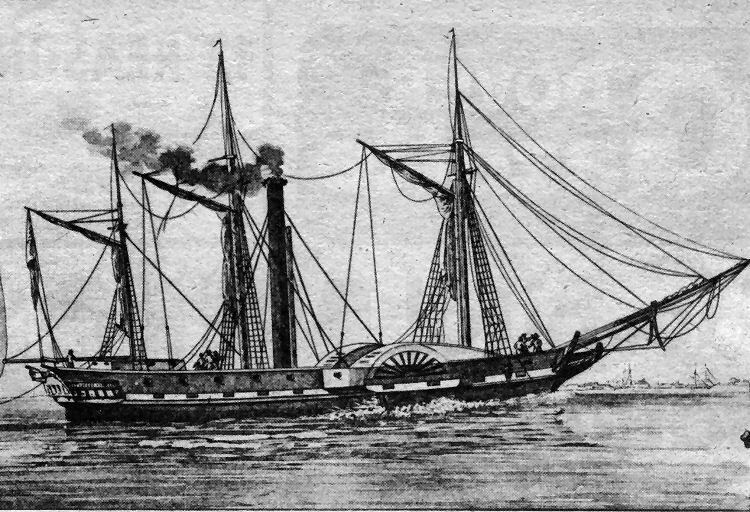 The Curacao was the first steamer in the Netherlands Navy, and remained in service until 1846. On being fitted out with engines in Holland she had a displacement of 438 tons. Her bulk was sold to shipbreakers in 1850. The picture above shows another vessel built at Dover. Pictured centre she was the sloop of war Cherub, typical of the type of vessel built at Dover in the late 18th century and early 19th century. She was built at the yard of a Mr King and launched in December 1806. In the picture she is shown with the frigate Phoebe (right) capturing the American ship Essex of Valparaiso on 28th March 1814.